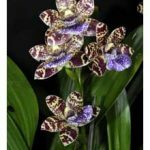 According to the latest version of the OSCOV Judging Handbook, the Zygopetalum Alliance includes all hybrids and intergenerics that have Zygopetalum in their breeding. Common intergeneric hybrids listed are Hamelwellsara, Propetalum, Zygocolax and Zygoneria but there are many others. The handbook is out of date already, as I see that the Royal Horticultural Society has recently replaced Zygocolax with Zygopabstia. Pabstia jugosa has long been accepted as the correct name for the species Colax jugosus, so the change from Zygocolax to Zygopabstia is quite logical and overdue. Those who grow the popular hybrid Zygocolax Elfin Jade should now change its label to Zygopabstia Elfin Jade. This was one of the first in the genus but now there are 49 in all. Propetalum, the intergeneric hybrid genus between Zygopetalum and Promenaea, now consists of 23 registered hybrids. They include Propetalum (Pptm.) Rhonda Ward (Promenaea xanthina x Zygopetalum John Banks), registered in 1994 by the late Ron Pearce, who is fondly remembered by many Victorian orchid growers. Zygoneria (abbreviated Zga.) 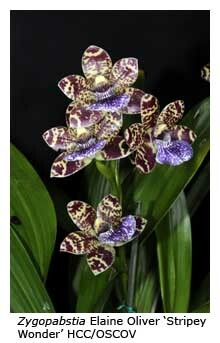 is a hybrid between Zygopetalum and the relatively uncommon natural genus Neogardneria. Zygoneria Dynamo (Neogardneria murrayana x Zygopetalum Helen-Ku) and Zygoneria Adelaide Meadows (Zygo. Titanic x Zga. Dynamo) are two common hybrids made during the 1990s but there are at least fifty others in this man-made genus. Hamelwellsara (abbreviated Hmwsa.) 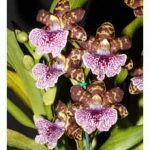 is an intergeneric hybrid comprising five different genera (Aganisia, Batemannia, Otostylis, Zygopetalum and Zygosepalum). If you think that’s a bit over the top, how about Monkhouseara (abbreviated Mkhsa. = Aganisia x Batemannia x Otostylis x Pabstia x Zygopetalum x Zygosepalum) and Masonara (abbreviated Msna. = Aganisia x Batemannia x Otostylis x Pabstia x Promenaea x Zygopetalum x Zygosepalum)? Zygostylis (abbreviated Zsts. 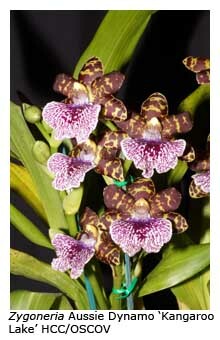 = Otostylis x Zygopetalum).